Te Anau is at first glance similar to a small version of Wanaka – both on the eastern side of large lakes with mountains to the west. 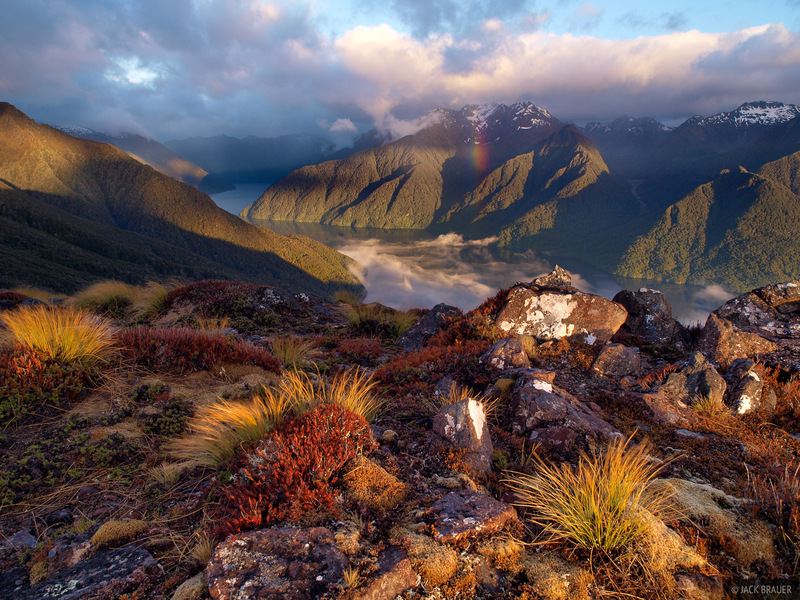 However, while Wanaka is known for its proximity to several famous ski fields, Te Anau is the access point to three of the famous Great Walks – the Routeburn, Milford, and Kepler Tracks. Two days ago I walked out of Te Anau and hiked a portion of the Kepler Track, up to the Luxmore Hut which sits just above bushline near a high ridgeline 1000 meters above the lake. The “Luxmore” sounds like a fancy hotel name, and actually this hut is pretty fancy as far as huts go. It has large windows and porches with views of the Murchinson mountains and Lake Te Anau, and like most of the Great Walks huts, it has stoves and flush toilets – luxury items to be sure. Anyways, the weather forecast was not promising upon my departure, so my plan was to just hike to the hut, spend a day there dayhiking, then hike back down the third day. 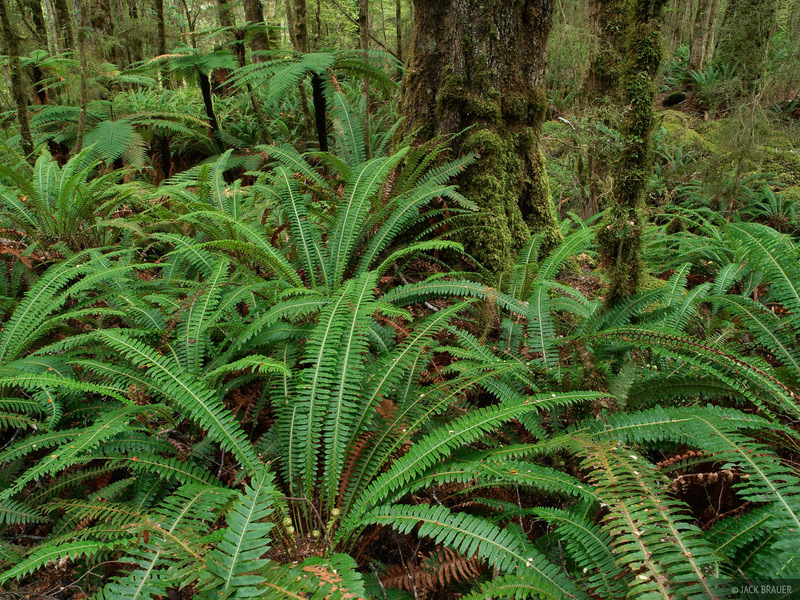 Lush fern-filled rainforest along the Kepler Track, near Lake Te Anau. The trail leaves the town of Te Anau, goes around the lake shore and enters a beautiful forest with vast expanses of low ferns. Unlike other rainforests I’ve visited here, in this forest you can see pretty far through the trees, and thus it was much more photogenic I thought. Plus the morning was perfectly calm and overcast, so I couldn’t help but stop every several hundred meters to take another photo. The Luxmore Hut was almost completely full of people on the first night, and that night in the bunkroom there was such a rhythm of snoring, with such a variety of snorts, rumbles, pops, wheezes, and whistles that it sounded like some kind of strange Monte Python machine made of human tubes. 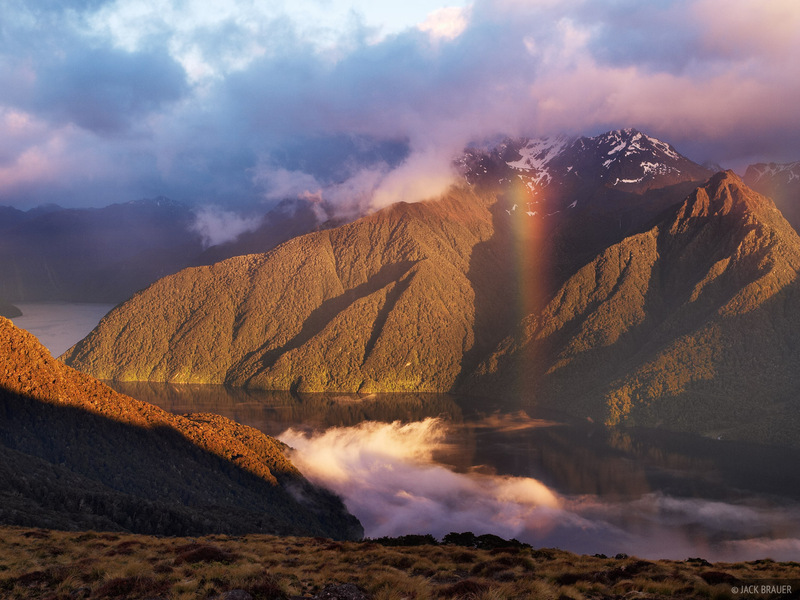 Sunrise rainbow over a fiord arm of Lake Te Anau, with the Murchison Mountains behind, as seen from the Kepler Track. I woke up early, hiked a ways uphill, and caught some great sunrise light with a partial rainbow over the lake and mountains… very cool. After hiking nearby Mt. Luxmore, I went back to the hut and it rained the rest of the day. Sunrise paints the landscape over a fiord arm of Lake Te Anau, with the Murchison Mountains behind. In the evening the clouds lifted a bit and I got some more shots of the mountains peeking (no pun intended) through the mist. 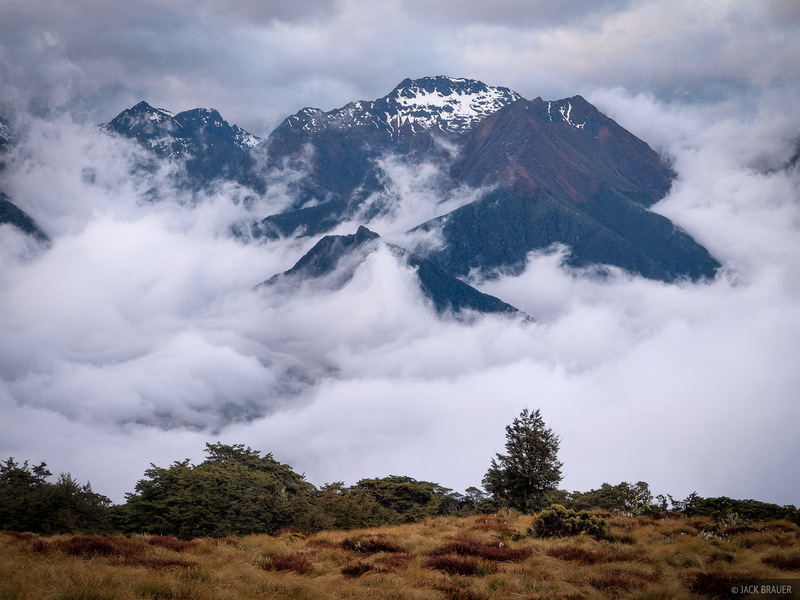 The Murchison Mountains emerge from the clouds during stormy weather, as seen from near the Luxmore Hut along the Kepler Track. The next night there was much less people (and no snoring!) but the wind was raging and the whole building was shaking. In the early morning it was still howling and raining, so I figured I’d just stay in bed. BAD DECISION. I happened to wake up a bit later only to see a glowing red hillside of alpenglow, and the hugest brightest rainbow with a backdrop of pink misty mountains. Incredible. I jumped out of bed, threw on some pants, grabbed my camera, and ran down to get some shots. Of course by that time it was all gone. D’oh! So today I hiked back to town in the pouring rain. Believe it or not, after 5 weeks of tramping in the mountains of New Zealand, this was the first time I’ve had to hike in the rain! There is a good reason why. So far this spring the weather has been in a fairly consistent cycle: about 2-4 days fine weather, followed by 2-4 days rainy weather, over and over. So, by a bit of forecast-watching and planning accordingly, I’ve been able to time all my tramps during the good spells, and travel and relax in the towns during the poor weather. This is one huge advantage of travelling in New Zealand during the shoulder season when there’s not so many tourists that everything needs to be planned ahead with reservations. In fact, now that December is near, I have certainly noticed a huge increase in tourists, and I’m having to book reservations for hostels, shuttles, etc etc. Some activities are fully booked! (I wanted to do a multi-day kayak trip in Doubtful Sound – no go). I’m not a big fan of traveling on an itinerary, so I think I’d be frustrated if I came here in the middle of the summer.